Scaled Agile Framework® pronounced SAFe™ – All individuals and enterprises can benefit from the application of these innovative and empowering scaled agile methods. At the Team Level: Scrum with XP engineering practices are used. Design/Build/Test (DBT) teams deliver working, fully tested software every two weeks. There are five to nine members of each team. The scrum team is renamed as the DBT team (from Design / Build / Test) and the sprint review is described as the sprint demo . It makes it easier to see the connection between the company roadmap/vision and day-to-day work. 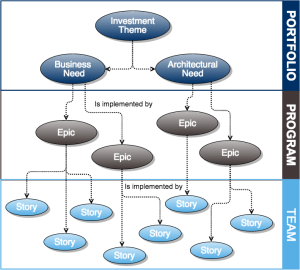 High level view of Business and Architectural needs behind the company investment and its connection to the particular epic on the program level, then story implemented on team level is helpful during the planning. Similarly, the HIP Sprints (from Hardening / Innovation / Planning) scheduled at the end of each PSI. Spikes is A story or task aimed at answering a question or gathering information, rather than at producing shippable product. Have clear objectives and outcomes for the spike. Be clear on the knowledge you are trying to gain and the problem(s) you are trying to address. It’s easy for a team to stray off into something interesting and related, but not relevant. Be timeboxed. Spikes should be timeboxed so you do just enough work that’s just good enough to get the value required. Features are services provided by the system that fulfill stakeholders needs. They are maintained in program backlog and are sized to fit in PSI/Release so that each PSI/Release delivers conceptual integrity. Features bridges the gap between user stories and EPics. In IT/PMI environments the Program Manager or Senior Project Manager might fill one of two roles. If they have deep domain expertise, they are likely to fill the Product Manager role. If they have strong people management skills and understand the logistics of release they often become the Release Train Engineer SAFe makes a distinction between content (what the system does) and design (how the system does it). There is separate “authority” for content and design. The Product Manager (Program Manager) has content authority at the program level. S / He defines and prioritizes the program backlog. SAFe defines an artifact hierarchy of Epics – Features – User Stories. The program backlog is a prioritized list of features. Features can originate at the Program level, or they can derive from Epics defined at the Portfolio level. Features decompose to User Stories which flow to Team-level backlogs. Features are prioritized based on Don Reinersten’s Weighted Shortest Job First (WSJF) economic decision framework. The System Architect has design authority at the program level. He collaborates day to day with the teams, ensuring that non-functional requirements (NFRs) are met. He works with the enterprise architect at the portfolio level to ensure that there is sufficient architectural runway to support upcoming user and business needs. The UX Designer(s) provides UI design, UX guidelines and design elements for the teams. In a similar manner, shared specialists provide services such as security, performance and database administration across the teams. The Release Train Engineer (RTE) is the Uber-ScrumMaster. The Release Management Team is a cross-functional team – with representation from marketing, dev, quality, ops and deployment – that approves frequent releases of quality solutions to customers. For agility at scale, a small magnitude of modeling has been introduced to support the vision , upcoming features, and ongoing extension to the upcoming Architectural Runway for each Agile Release train. Agile Release train is the long lived team of agile teams typically consists of 50 to 125 individuals, that serves the program level value delivery in SAFe. Using a common team sprint cadence each train has dedicated resources to continuously define build test and deliver value to one of the enterprise value streams. Teams are aligned to a common mission via a single program backlog and include the program management, architectural, UX guidance and release train engineer roles. Each train produces valuable and evaluate able system level potential shipable increment at least 8 to 12 weeks accordance with PSI Objectives established by the teams during each release planning event but team can release any time according to market needs. Cadence is what gives a team a feeling of demarcation, progression, resolution or flow. A pattern which allows the team to know what they are doing and when it will be done. For very small, or mature teams, this cadence could by complex, arrhythmic or syncopated. However, it is enough to allow a team to make reliable commitments because recognizing their cadence allows them to understand their capability or capacity. Program EPics affect single release train. Shared Iteration schedules allow multiple teams to stay on the same cadence and facilitate roll up reporting. Release Capacity Planning allows you to scale agile initiatives across multiple teams and deploy more predictable releases. Cross team dependencies are quickly identified and made visible to the entire program. The Portfolio Vision defines how the enterprise’s business strategy will be achieved. PPM has a central role in Strategy, Investment Funding, Program Management and Governance. Investment Themes drive budget allocations. Themes are done as part of the budgeting process with a lifespan of 6-12 months. Epics are enterprise initiatives that are sufficiently substantial in scope , they warrant analysis and understanding of potential ROI. EPics require light weight business case that elaborate business and technology impact and implementation strategy. EPics are generally cross cutting and impact multiple organizations,budget, release trains, and occur over multiple PSI. Portfolio Epics affect multiple release trains. Epics cut across all three business dimensions of Time ( Multiple PSI,years) , Scope (Release Trains, Applications,solutions and business platforms) , Organizations(Department, Business units, Partners, End-To-End business value chain). Portfolio philosophy is centralized strategy with local execution. Epics define large development initiatives that encapsulate the new development necessary to realize the benefits of investment themes.Program Project Management represents individuals responsible for strategy, Investment funding, program management and governance. 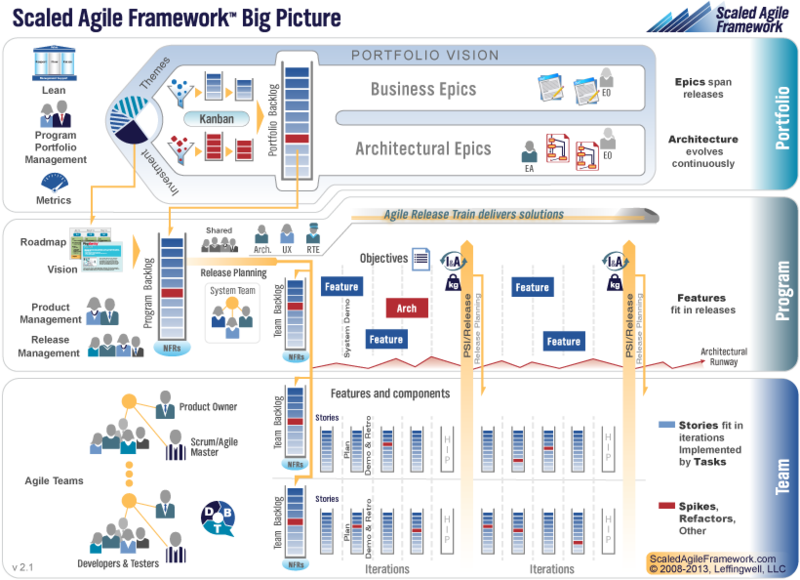 They are the stewards of portfolio vision, define relevant value streams,control the budget through investment themes, define and prioritize cross cutting portfolio backlog epics, guide agile release trains and report to business on investment spends and program progress. SAFe provides seven transformation patterns to lead the organization to program portfolio management. Rolling Wave Planning is the process of project planning in waves as the project proceeds and later details become clearer. Work to be done in the near term is based on high level assumptions; also, high level milestones are set. As the project progresses, the risks, assumptions, and milestones originally identified become more defined and reliable. One would use Rolling Wave Planning in an instance where there is an extremely tight schedule or timeline to adhere to; whereas more thorough planning would have placed the schedule into an unacceptable negative schedule variance. This is an approach that iteratively plans for a project as it unfolds, similar to the techniques used in Scrum (development) and other forms of Agile software development. Progressive Elaboration is what occurs in this rolling wave planning process. Progressive Elaboration means that over time we elaborate the work packages in greater detail. Progressive Elaboration refers to the fact that as the weeks and months pass we have planned to provide that missing, more elaborated detail for the work packages as they now appear on the horizon. Investment themes represent the set of initiatives that drive the enterprise’s investment in systems, products, applications, and services. Epics can be grouped by investment themes and then can visualize relative capacity allocations to determine if planned epics are in alignment with the overall business strategy. Epics are large-scale development initiatives that realize the value of investment themes. There are business epics (customer-facing) and architectural epics (technology solutions). Business and architectural epics are managed in parallel Kanban systems. Objective metrics support IT governance and continuous improvement. Enterprise architecture is a first class citizen. The concept of Intentional Architecture provides a set of planned initiatives to enhance solution design, performance, security and usability. SAFe patterns provide a transformation roadmap. SAFe suggests development and implementation of kanban systems for business and archtiecture portfolio epics. Architectural epics kanban system suggests visibility , Work In Process limits and continuous flow to portfolio level architectural epics. This kanban system has four states, funnel, backlog, analysis and implementation. The architecture epic kanban is typically under the auspices of CTO/ Technology office which includes enterprise and system architects. Business epics kanban system suggests visibility , Work In Process limits and continuous flow to portfolio level business epics. This kanban system has four states, funnel, backlog, analysis and implementation. The business epic kanban is typically under the auspices of program portfolio management . comprised of those executives and business owners who have responsibility for implementing business strategy. 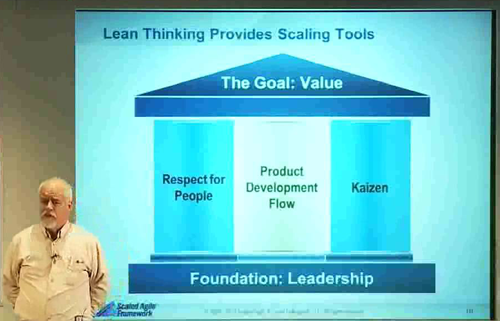 The scaled agile framework is based on number of trends in the modern software engineering. Investment themes reflect how a portfolio allocates budgets to various initiatives that it has allocated to the portfolio business strategy. Investment themes are portfolio level capacity allocations in that each theme gets resource implied by the budget.